Call NOW 1800 678 982, or get a quote including freight to your door by sending us a quote request. 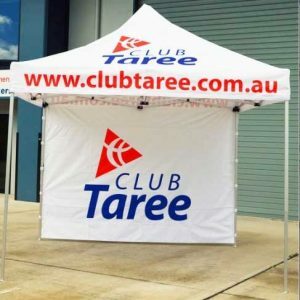 Some years ago, QuikShade Australia sold a range of imported gazebos under the brand name of Quikshelter. These were low cost, and only available as plain colours. Printing costs then were high, and due to the surface printing methods of the time, they were susceptible to cracking and peeling. QuikShade Australia are proud to have been producing frames here in Australia since 1985, as the majority of other frames sold in Australia are imported but based on the original design. We have not sacrificed our standards of quality or workmanship, and our frames are still the only type on the market with a 20 year limited lifetime warranty for failure through normal wear and tear. We appreciate that not everyone can afford a “REAL” QuikShade, so we have sourced a range of quality imported frames that we are selling under our Quikshelter brand name; this is not the same product which we sold previously. The new Quikshelter frames have a 3 year warranty against manufacturing defects, and the covers and walls have 12 months warranty. Over 80% of our customers require printing on their covers or walls, so each customer who needs custom artwork, we do not charge for preparing artwork and the artwork created belongs to the customer. Logos can be redrawn if necessary, also at no extra charge to the customer. 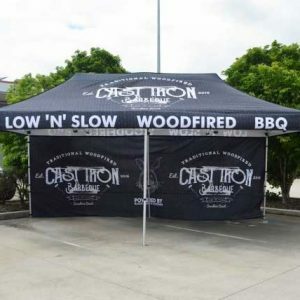 The highest quality dye sublimation printing available is used to ensure your Quikshelter will stand out in the crowd, and because they are printed, you can have any colours you like, again, at no extra charge. At Quikshade we want all our valued clients to know that this is all part of the excellent service we continue to provide; high-quality products at an affordable price.